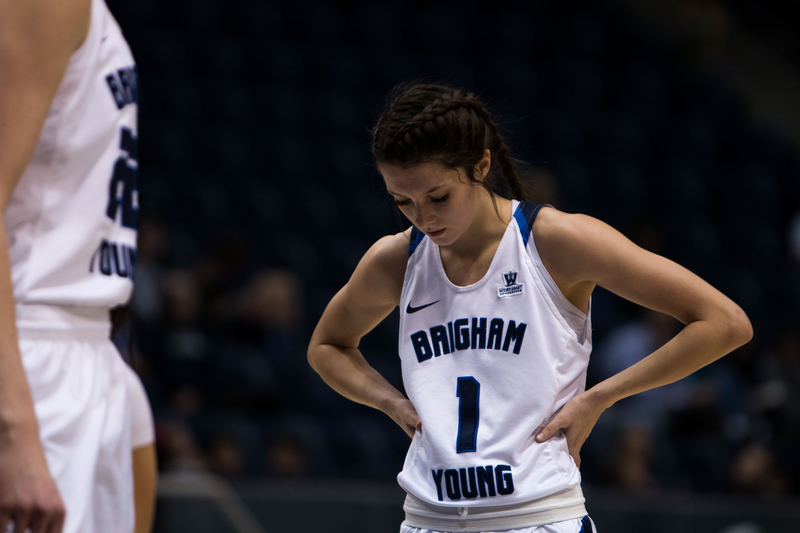 BYU women’s basketball fell short of the comeback, losing to Pacific 83-76. The team’s record fell to 12-9 on the season and 7-3 in conference play. Sara Hamson got great position down low to get the easy first bucket of the game for BYU. Brenna Chase had a huge steal for the Cougars followed by an effortless layup, giving BYU a quick 6-0 lead against Pacific. The Tiger came back, but Chase hit back-to-back threes to tie up the game at 17. The Cougars were right behind Pacific 21-20 to end the first quarter. Cassie Devasharayee drained a three point shot to give BYU the lead, 26-24, at the start of the second quarter. Pacific led 46-36 at the end of the first half. BYU tuned the ball over 15 times in the first two quarters, giving up 22 points to Pacific that could have been avoided. The Cougars opened the second half determined, going on a 5-0 run. Chase and Devashrayee were both hit double digits to keep the Cougars in the game, but still trailed Pacific 53-45. The Cougars outscored the Tigers in the third quarter, but still found themselves behind 59-51. Judkins called a timeout late in the game as the Tigers pulled out to an insurmountable 65-54 lead. The Tigers were able to keep BYU at bay by continuing to hit shots, and came away with the win. BYU comes home to take on Loyola Marymount in the Marriott Center Feb. 1 at 7 p.m. MST. The game will be broadcast on BYUtv.